I present to you: totally rad architecture! : My birthday gift, on my birthday, to you! Next year (maybe? ), I’ll be here (who knows???! ), and this will be my birthday gift to me! Seriously, Beijing was one of the coolest weeks of my life. Temperature wise, not so much, but man was it awesomely huge – ancient and uber modern all at once. The Olympic Park, a trek (because of/ despite of the numerous interconnected metro lines) from our hotel located just east of the Forbidden City (= amazing location!!!) was massively impressive, even when filled with just tourists. Sadly, the h20 cube didn’t look like this in the summer of 2009! Actually, sad doesn’t begin to describe my disappointment and how much I want to return to what looks like it may be the cleanest, healthiest, safest (it looks like most of bolts made it in to the slides?!) 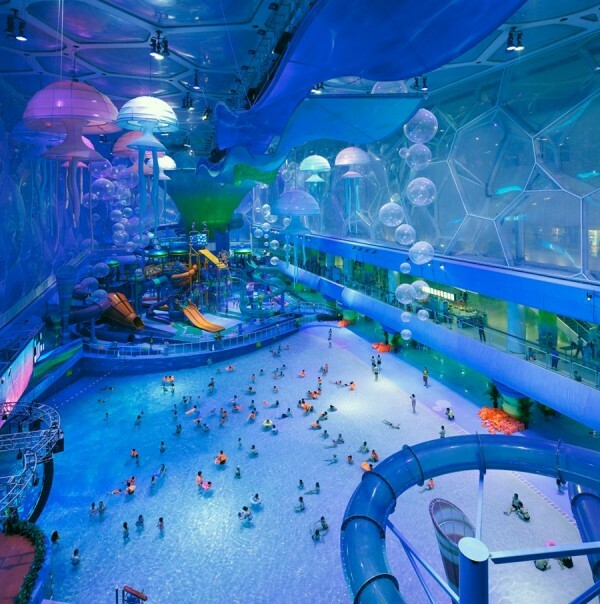 water park in China (and I’ve survived water parks in China, but that story is for another day!). Have fun, Chinese friends, in your impossibly silly bathing suits (also, a story for another day)! I’m so jealous right now!!! !